Paint the whole world with a rainbow. I have to confess that, as a tot, those words used to fill me with disappointment. ITV used to show two kids programmes at midday, a 10 minute one, followed by a 20 minute one. Rainbow was one of the 20 minute shows and was usually on around twice a week. At the time I didn’t realise that TV programmes were scheduled each week, I thought it was kind of random, so I would sit there hoping that it would be Pipkins that came on next, and was always disappointed when it was Rainbow. Looking back on Rainbow now with an adults eye view, I must say I have a new found admiration for the show. It is amazing just how risque it could be at times. 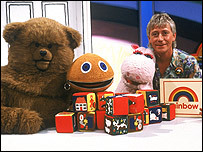 Geoffrey Hayes was the host of the show, who was sort of a foster father to Zippy, George and Bungle. At least, thats how it appeared. Geoffrey would look after his “kids” by reading them stories, helping them make things and generally teaching them about the big wide world. 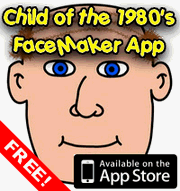 This was interspersed with a tune from songsters Rod, Jane and Freddy, and an animation of a picture being drawn (called Lines and Shapes, one of Cosgrove Halls first productions I believe). I may have been disappointed when Rainbow came on, but I soon forgot all that when Zippy and George came on. They were the best thing about the show, and what a double act. George was a pink hippo, with long eyelashes and a very softly spokenvoice. I always assumed George was female (short for Georgina perhaps) but apparently George was a boy. Zippy was a yellow, er, um… Well, zip-mouthed alien I suppose. He was loud and grating and extremely cocksure of himself. If anybody was good at anything, Zippy was better. Normally he wasn’t of course, but when he was, he’d go on and on about how great he was, until somebody would lean over and zip his mouth shut. Zippy and George were both puppets, who strangely only had one arm each. Bungle was a big brown bear (a bloke in a suit) and he was a complete idiot, and not in the lovable, means well way. If someone was going to do something stupid, it was Bungle, which led to him being called Bungle Bonce by Zippy – a wonderful putdown if ever there was one. Bungle was there to do things which the puppets (being one armed and confined to a desk) couldn’t do, like dance about or skip. Bungle could be a little effeminate at times too, just like George. I distinctly remember him prancing about in a Tutu pretending to be a ballerina. Rod, Jane and Freddy were the other humans on the show, and would turn up at some point to sing about being at the bottom of the sea, waiting for their washing to be done, or doing a massive dot to dot puzzle with paint whilst singing “We’re joining the dots, there are lots and lots“. Rod always scared me a bit due to his beard and long hair. Rod, Jane and Freddy were apparently also involved in a kind of bizarre love triangle, though you never knew it on the show. In real life, Rod and Jane were married, but Jane had an affair with Freddy, and they split up. All this whilst wearing brightly coloured dungarees and happily singing together about baking a cake or such like. Rainbow ran from 1972 to 1992, though it had a rather unsuccessful revival attempt in the late 1990s. It also made the news in July 2002 after Geoffrey, who had purchased the original Rainbow puppets at an auction, then had them stolen from his car whilst he took a break at Membury services on the M4. Rainbow now appears from time to time on Nick Jr. classics in the evening. Try watching it again, and you might be surprised how the show you remembered from your youth suddenly takes on a completely different meaning when watched as an adult. This entry is filed under TV - Kids	and was posted on October 15th, 2007. You can follow any responses to this entry through the RSS 2.0 feed. You can leave a response, or trackback from your own site.